University Village is a 55+ condo community in Charlottesville, VA. This active adult neighborhood consists of just 94 units that were constructed between 1990 and 1994. With an elegant clubhouse that provides luxurious amenities and activities, homeowners can enjoy a social and vibrant lifestyle in a close-knit neighborhood setting. Residents can also easily establish lifelong friendships with neighbors based on common interests. The Village Club is the central hub of physical activity and social recreation in this active adult community. This clubhouse provides a rich lineup of amenities between its upper and lower levels. Homeowners can maintain a fitness regimen in the exercise or aerobics room. An indoor heated pool is perfect for swimming a few laps and the spa is great for relaxing after an invigorating workout. There are three dining rooms where homeowners can enjoy a delicious meal. Social spaces like a game room, card room, and arts and crafts room are perfect for exploring new hobbies and mingling with friends. Residents can also spend some quiet time with a good book in the Priska Szaloki Library. Neighbors gather in the meeting and conference room to attend special events or guest lectures. The atrium is a convenient place to host a private party. When guests come to visit, the clubhouse has four guest rooms where they can stay overnight. Outdoors, residents can challenge a friend to a game of bocce ball. Homeowners also love taking scenic strolls along the neighborhood's walking and biking trails. They can also spend time on the outdoor patio to get some fresh air and appreciate the garden and natural space. Another benefit of living in this age-restricted community is the chauffeur car service that can take residents into town for errands. University Village was developed between 1990 and 1994 and offers 94 condo units with elevator access. Active adult homebuyers can choose from a variety of resale units in this 55+ community. They range in size from approximately 900 to 2,500 square feet with one or two bedrooms, one to three bathrooms, and underground garage parking. Most units feature luxurious interior designs, open layouts, modern appliances, spacious master suites, private balconies, and carpet or hardwood floors. Some units also enjoy scenic views of the Southwest Mountains. Residents love the low-maintenance lifestyle in this active adult community. A monthly homeowners' association (HOA) fee takes care of exterior and common area maintenance, snow and trash removal, landscaping, road upkeep, security systems, cable T.V., utilities, and access to the clubhouse. Thanks to the HOA taking care of tedious exterior chores, homeowners have more time to do as they please. Homeowners can socialize with neighbors in the Village Club, have dinner with friends, or attend private parties and community events. They can also start a club, pick up a new hobby, or explore their crafty side. Neighbors can play each other on the bocce ball court or have an outdoor picnic to enjoy the beautiful landscape. Residents often gather for games, cards, bridge, or special events that keep them busy and social throughout the year. This friendly and welcoming atmosphere allows like-minded adults to build lasting relationships. Charlottesville is a vibrant area that has much to offer. Residents of University Village have quick access to Route 250 and 29 for getting around town. The University of Virginia is just six minutes away and provides college sporting events, performances, and other entertainment options. Medical facilities can also be found on campus at the UVA Hospital as well as in the downtown area at Sentara Martha Jefferson Hospital. Shopping is conveniently located nearby at the Barracks Road Shopping Center where homeowners can find coffee shops, restaurants, grocery stores, and a CVS Pharmacy. There are a few golf courses close by including Birdwood Golf Course and Farmington Country Club that are sure to please players. Outdoor enthusiasts will love all of the recreational options nearby like Penn Park, McIntire Park, and Greenbriar Park. Downtown Charlottesville is 13 minutes away and offers additional entertainment and cultural attractions. Residents can visit Downtown Mall, Virginia Discovery Museum, The Jefferson Theater, and McGuffey Art Center. Richmond is about an hour away and can be a fun destination for a weekend getaway. When traveling long distance is required, Richmond International Airport is also nearby. 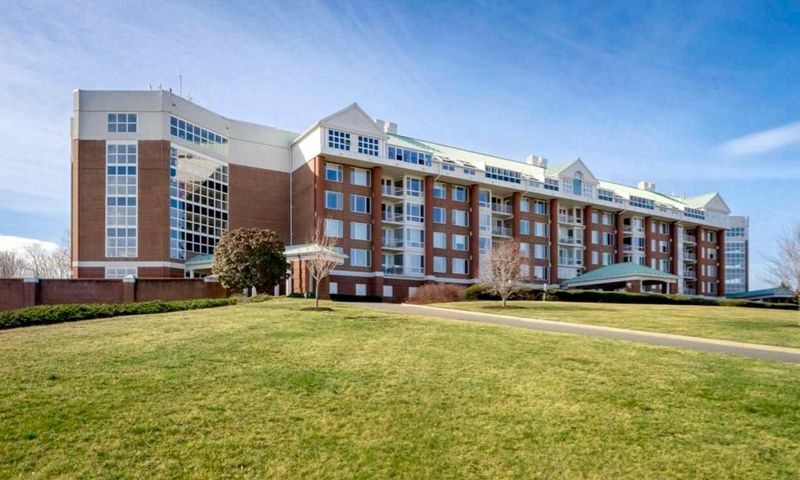 University Village provides a prime location close to daily conveniences and attractions within a scenic setting for active adult homebuyers in Central Virginia. There are plenty of activities available in University Village. Here is a sample of some of the clubs, activities and classes offered here. University Village was developed between 1990 and 1994 and offers 94 condo units with elevator access. Active adult homebuyers can choose from a variety of resale units in this 55+ community. They range in size from approximately 923 to 1,547 square feet with one or two bedrooms, one to three bathrooms, and underground garage parking. Most units feature luxurious interior designs, open layouts, modern appliances, spacious master suites, private balconies, and carpet or hardwood floors. Some units also enjoy scenic views of the Southwest Mountains. Please Note: Not all floor plans are available at this time. 55places.com is not affiliated with the developer(s) or homeowners association of University Village. The information you submit is distributed to a 55places.com Partner Agent, who is a licensed real estate agent. The information regarding University Village has not been verified or approved by the developer or homeowners association. Please verify all information prior to purchasing. 55places.com is not responsible for any errors regarding the information displayed on this website.